November 23, 2018, Harold Edward Ogulin wistfully departed from our lives here in Lake County when he was called home to tend the “Big Ranch” in the sky. Born September 20, 1925 on the family ranch in Clearlake Oaks, Harold was a true Lake Countian. He served this country proudly in the United States Navy from December 1943, being Honorable discharged in October of 1947. 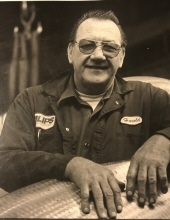 After serving his country, Harold being his life long career in the shipyards of the Bay Area as a Machinist and was part of the Machinist Union for 65 years, and Yes, he would commute everyday from his Ranch in the Oaks to the Bay Area and back for 35 years! At home here in Lake County, Harold enjoyed life on the Circle O Ranch, and the pleasures of country living, such as Hunting. He also loved dancing and bingo and was a Charter Member of the Clearlake Oaks Moose Lodge 2284. To carry on his memories and legacy Harold leaves behind his gracious wife, Grace, of 58 amazing years, Sons, Joe (Debbie), Rich (Audra), Daughters, Debbie and Kathy. Life’s later years where filled with the joy of 7 Grandchildren and 4 Great Grandchildren. We all will dearly miss him in our lives and in the community. Harold was laid to rest November 30th 2018 at Lower Lake Cemetery. To send flowers or a remembrance gift to the family of Harold Edward Ogulin, please visit our Tribute Store. "Email Address" would like to share the life celebration of Harold Edward Ogulin. Click on the "link" to go to share a favorite memory or leave a condolence message for the family.